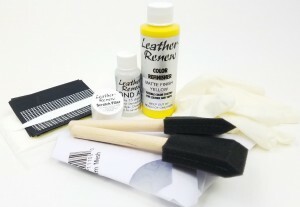 This leather repair and dye kit contains virtually everything you'll need to complete the repair of your kitty damage! The work itself is actually very easy! Leather Renew's Kitty Damage Repair Kit contains 1/3 oz of our Scratch/Crack Filler product, 4 oz. of our water based leather color coat dye (enough to re-finish over 25 square feet of leather with a permanent finish), leather prep cleaning pads, gloves, strainers, sandpaper, foam applicator brushes, 1/8 oz of our Bond Aide dye adhesion additive, complete instructions, and unlimited e-mail project support just in case you need a little bit of help.